Imagine winning a race without the thrill of crossing the finish line. No cheering crowds, no medals, not even a pat on the back from a good friend. Feels anticlimactic, doesn’t it? Yet far too often, products motivate users towards the finish line and leave them hanging there. Product experiences are often optimized to make it simpler, faster, and more delightful for users to find value. This is no easy feat, but sufficiently motivating users is just half of the battle. Building long-term engagement, and getting users to want to complete tasks again and again, also requires celebrating task success. Celebrating a completed task signals to users that what they’ve just done matters—that the action you nudged them towards was indeed worth it. This sets the foundations for habitual product use. Here are 5 great examples of products motivating users towards meaningful actions and then celebrating users’ success. Google is a leader at creating beautiful and effective user experiences. Their products often excel at motivating and celebrating users around task success, which is one of the core metrics they use to improve user experience. Email can be both a productivity booster and a productivity killer. To ensure that email stays helpful, Inbox by Gmail makes it extremely easy for users to go through their emails at a faster speed. While the functionality of mass-selecting emails isn’t new, Inbox reduces the amount of clicks to perform the same task and presents a cleaner, more pleasing interface. And instead of marking emails as “read,” Inbox users mark emails as “done.” How much more productive do you feel have “done” something over having “read” something? 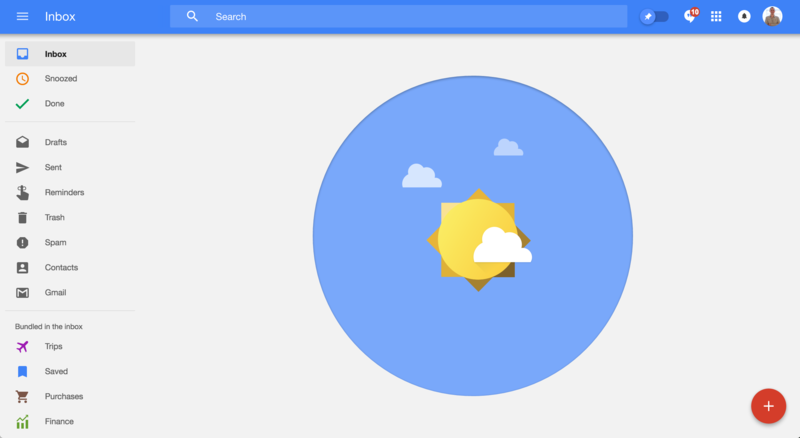 Users who get all their emails “done” are rewarded with sunny skies. For many, achieving inbox zero is an intrinsically motivating tasks already, and the bright outlook adds further delight. Motivating and rewarding users for desired behaviors isn’t limited to major UI changes. Properly motivating users to perform frequent and routine tasks can be just as powerful in creating a pleasant user experience. Canva knows the importance of details in design. That’s why they don’t overlook small opportunities to motivate and celebrate users. 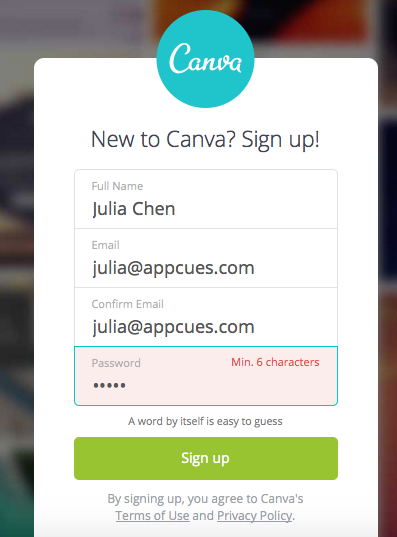 When new users sign up with a weak password, Canva simply tells them in a human, straight-forward voice and indicates the character requirement in-line. After users fix their passwords, they are cheered on by playful and creative copy, that also takes security seriously. While this may seem minor, users are constantly performing mundane tasks on their way to reaching an Aha! moment. Making these tasks more delightful with copy, illustration, and personality goes a long way in enforcing a positive brand image. Two-sided marketplaces often get a bad rep for not being fair to service providers. Lyft tries to distinguish itself by being a good place to work and creating a strong sense of community. 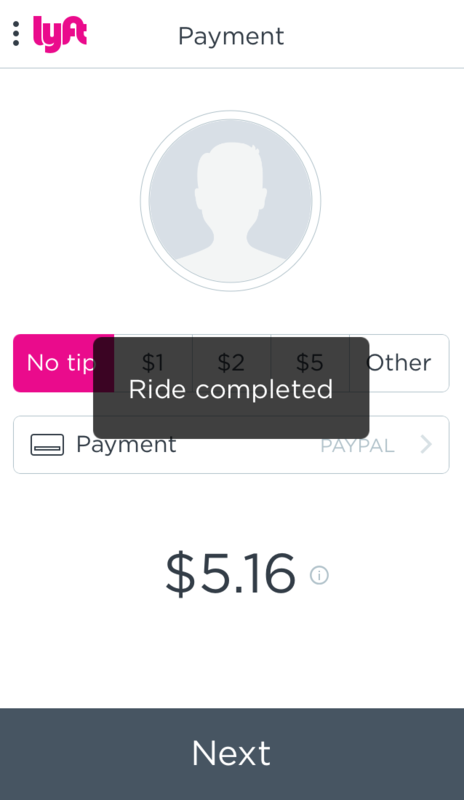 Once users complete a ride on Lyft, the app opens up to screens to tip and rate the driver. While both are skippable, the screens are persistent and appear automatically a few times after a user takes a ride. 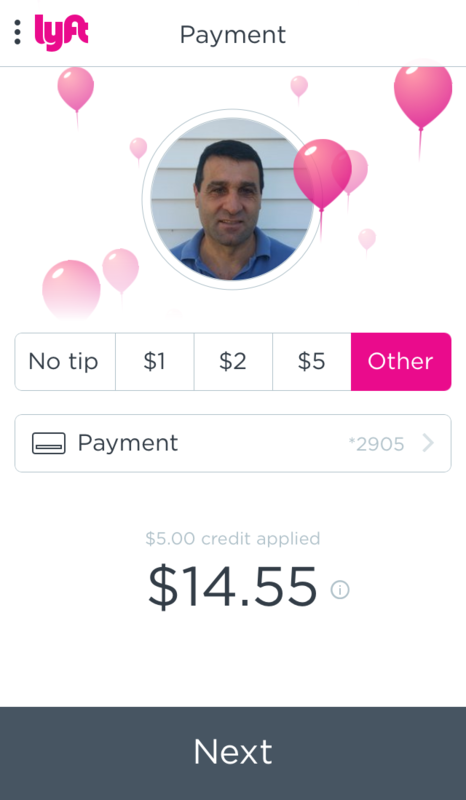 Users probably rate their drivers more often than they tip drivers, so Lyft could have put the rating screen first to solicit more ratings. But by drawing attention to tipping first, Lyft encourages users to support drivers. If users do tip, they are then prompted to choose how much on a modal. As the user tips more, more balloons float up in the background. 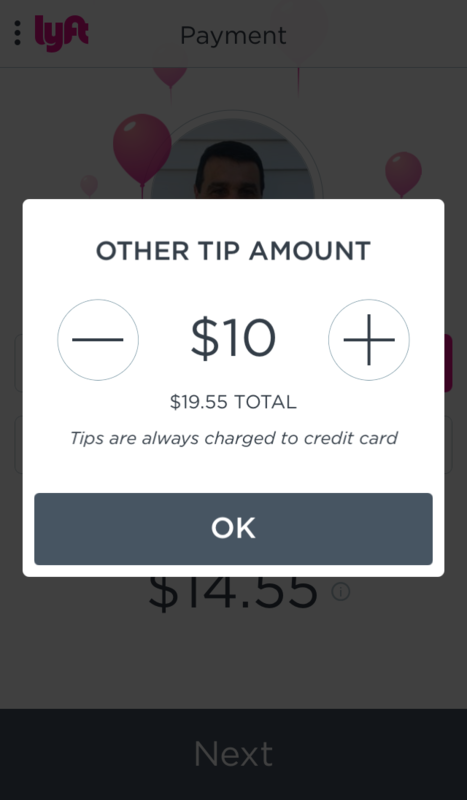 It’s a delightful design that makes users feel good about tipping and appropriately celebrates the driver for their work. Creating an email campaign can be a daunting process for new users, and MailChimp conveys empathy for users, without backing down from their brand's personality. When users finish creating a email campaign, they see this fun modal window that shows key information about the campaign and sets up excitement for its launch. 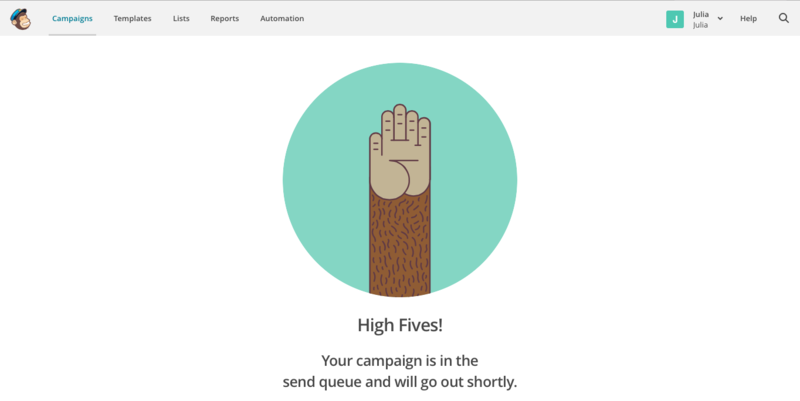 After users hit the “send now” button, MailChimp continues to support users by giving them a high five. This screen not only confirms a very important user action, but does so in an awesome and distinctly MailChimp way. Oftentimes, completing a task doesn’t just have implications for the individual user. This is especially true in B2B products in which teams act based on what collectively has, or has not, been accomplished yet. Knowing that different organizations have different customer support guidelines, Help Scout makes it easy for users to set up their own workflows and alerts. This helps the whole team stay on top of support. When individual users answer all of their support tickets, they see one of several celebratory messages. All too often, products motivate without celebrating. This can leave the user wondering whether or not the effort they put into your product was worth it. Which tasks are most worthy of motivation and celebration? How many times will users see these prompts? Can they be effective without being overbearing? Will an extra screen or alert add friction to the user experience? If so, is the value added from the extra dose of positivity worth it? If not, are there ways to minimize the friction with less intrusive UI patterns? At the very minimum, acknowledging a completed task serves as a much-needed confirmation. Users like to know that their email has been sent, their flight booked, and their credit card processed. But more importantly, celebrating success creates a more fulfilling user experience and drives users deeper into the product.